It’s the last Saturday of the month, which means it’s Give a Sh*t Book Club time! 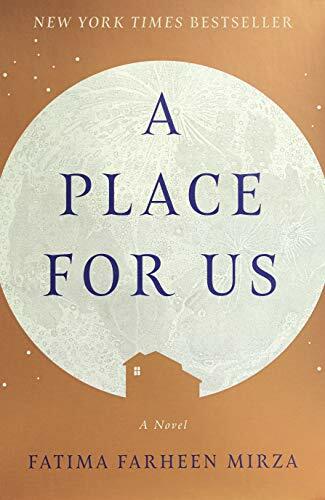 Our pick this month is A Place for Us by Fatima Farheen Mirza. This might just be my favorite book I’ve ever selected for the book club. I expected it to be good, as the author is a graduate of the prestigious Iowa Writers’ Workshop and this, her first novel, was chosen as the first book to be released by Sarah Jessica Parker’s new imprint at Hogarth. Still, I was not prepared for how deeply I would feel for these characters and how personally the story would resonate with me. I am always searching for a reading experience like this--where the characters become fully real people, and through observing their lives, I come to understand something new about being human. That, to me, is the highest form of literature and it’s the reason I read. I love books about complicated families, but I think A Place for Us is exceptional in the way it allows the reader to get to know each family member and see clearly their motivations. It’s so satisfying to me because in real life, you never get the bird’s eye view of your own family; you’re limited by your own perspective no matter how you to try understand where others are coming from. In a novel like this one, though, you truly see all sides to the situation. You recognize that each character makes mistakes, sometimes extremely damaging ones, but because you have the benefit of knowing their innermost thoughts, certain aspects of their nature, and their prior experiences, they are comprehensible to you, even if they aren’t to the other characters. I had this same feeling while reading another favorite novel, Everything I Never Told You by Celeste Ng, which if you haven’t read you really must! What touched me the most about this book was the spiritual reflection of the characters about the merciful nature of God. At the end of the book, Rafiq says, “Of all my mistakes the greatest, the most dangerous, was not emphasizing the mercy of God.” He knows by this point that his focus on avoiding sin and his anger when Amar fell short both contributed to Amar leaving the family. His perspective has changed in his advanced age; he is able to enjoy his grandchildren in a way he never could with his children when they were young. Seeing that transformation really got to me. And knowing that Amar hasn’t completely given up on the family, either, that he is calling and talking to his nephew on the phone? Wow. And then on the last page, when Rafiq tells his son he will wait at the gate for him...well, I cried a bunch. What is being a parent if not waiting at the gate, forever if need be, for your child? I really loved A Place for Us and hope you enjoyed it too! Comments are open below. Can’t wait to hear what you thought of this one!